Surprise, surprise! Here’s our second project, Love Get Chu! It’s a rather forgotten 2006 anime, which we’d been working on. 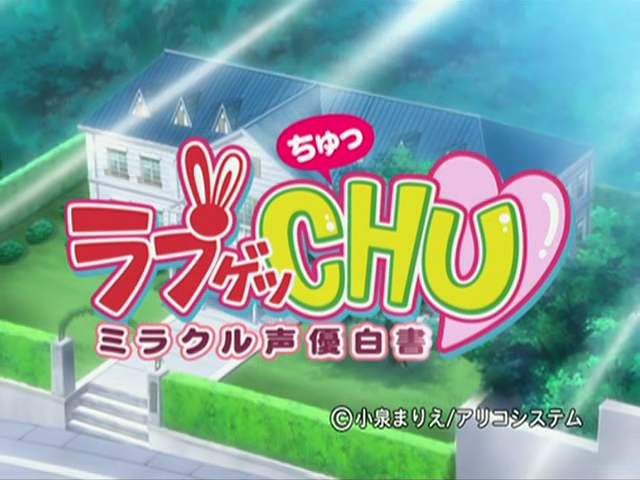 The full name of the anime is “Love Get Chu: Miracle Seiyuu Hakusho.” It’s about five girls aspiring to be voice actresses. Personally, I like this anime. For convenience, here are eps 1-15 in a MediaFire folder. In any case, it’s 25 episodes long. Episodes 1-15 have already been done by other groups. We’ll be doing 16-25, for completing the series. We’ll come to a decision later on doing the earlier episodes. Also, for this series, it’s pretty much a 2/3 man project, as the rest of the staff are busy with RL. There is no kara in this ep, but will be included from 17 onwards. Also, please excuse if there are issues in the release. Also, the only raws we have are 640×480 DivX5.11 raws, and there are no DVD Raws/DVDISOs. This explains the not-so-good quality of the video. ZeroYuki: As mentioned, this project only consists of 2 people working on it. So don’t expect it to be fabulous like Usagi Drop. I took a very liberal approach with this show. So for those of you who do not like what you see, I will offer you two alternatives. One, to wait for c1 or m33w who intend to continue this series. Two, wait for a v2 which will be complete with a TLC, TS and proper edit from our other core members. It is to be noted that the v2 won’t be released anytime soon. My intention is to try to complete this show. So don’t come to me saying this and this is bad because that will be focused only later when our TLC starts doing the first 15 episodes and also to rework my scripts. I am so happy that you guys have decided to sub this. You don’t know how excited I am for the other episodes. Actually, m.3.3.w has it as stalled/dropped because of lack of interest from the group, and C1 has been inactive for a full year now, so they’re effectively dead for the time being. So yes, you guys are the only ones doing this series. I am so happy as this is one of my remaining two stalled series that I would love to see finished. Just 9 more episodes to go! Yes! Thank you for picking up Love Get Chu. You’re my heroes! Thank you guys so… much for picking up this series! Great job on the subs too! As near as I can tell no other group seems to be doing Love Getchu so thanks because I enjoyed this show, what I have seen of it from Ayu and C1. If they were continuing you would expect something by now. ah you’re a saint for doing this… loved the first 13 eps and can’t wait for some more. Thank you so much !! I have discovered this anime few months ago, and I was so sad to not finished it !! Thank to you we can see the next episodes !! Hi, ive downloaded this episode and episode 17 ddl and niether are subbed, even when i turn the subs on and off, just wondering if im doing something wrong?